With blustery conditions and many snow squalls, I've had many birds at my feeders. That brings in the accipters too. I noticed this one sitting in the crabapple out front. I believe it's a Cooper's hawk. Another birder IDed it using these traits. The vertical, light-colored brush-cut in back:the horizontal dark top of the head:the eye appearing very far forward: ant the outer tailfeather successively shorter. 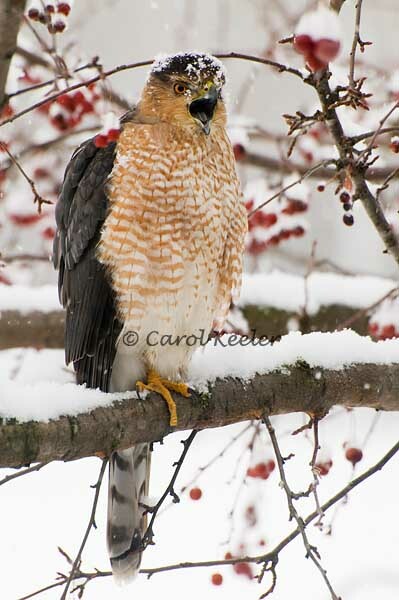 I have both sharpies and Cooper's hawks around my yard. This is the first time this year that I was able to catch one in the tree out front. It yawned several times as if bored. It was interesting that there were chickadees and tufted titmice actively going to the feeders with this big guy sitting there. Eventually, the Cooper's went for a bird, but did not catch it. It sat in a different spot for a bit, and then flew off. The next two images in the accipter gallery were for indentification purposes only.